"Greetings, amigo/amiga! 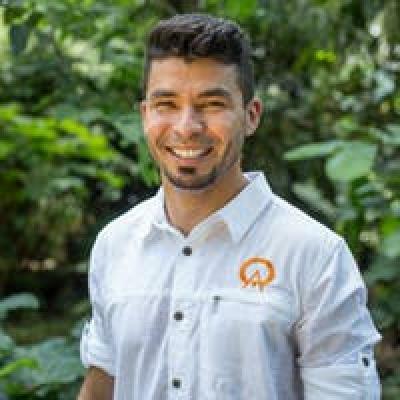 I'm Lester; originally from Nicaragua, my family and I moved to Costa Rica when I was 7 years old, and I've now lived in La Fortuna (the Arenal Volcano area) for well over 20 years. I consider this region to be the best in the entire country! I've been a travel professional since 2004, and have been a member of Team Anywhere since 2009. Throughout my career, I've learned about customer service, management, business operations...Anywhere is the company where everyone wants to work. We create unforgettable trips for our clients! When I talk to my university colleagues, I always tell them that I love what I do — I love sharing Costa Rica with travelers from around the world. Using my own experience and knowledge to craft incredible experiences and memories for our clients is a uniquely rewarding thrill. If you love thrills too, I've got some great beach recommendations: Caño Island has some of the best snorkeling and scuba diving in the country — I've seen whitetip reef sharks, sea turtles, and dolphins. Playa Conchal is a beach where the sand is composed of tiny crushed shells, and it's one of my favorite places to take my beautiful daughter, Luna (Spanish for 'moon'). She is absolutely the light of my life, and spending time with her is by far my favorite pastime. I can't wait to share new outdoor adventures with her as she continues to grow, and I'm so excited to help you and your family create memories and adventures of your own as we design your custom itinerary!" Lester, thank you so much for helping make our first visit to Costa Rica so wonderful. Really appreciate the way you scheduled our activities at the front end, leaving us a few lazy days at the beach to recover. Thank you for making our honeymoon one we will never forget!! Thank you again for your patience and assistance with our trip. I will (and have) recommended Anywhere to others for their travels. Absolutely fantastic job helping us get everything we wanted out of this trip. I can't wait to do it again, next time in Panama! Lester is the man! Thanks for an amazing trip! Pura Vida! Thanks again Lester for helping us throughout our stay! Really appreciated all your help in booking everything especially since we booked late. We loved the trip and haven't stopped talking about since we got back. Thanks so much for everything, we had an incredible time. Pura Vida! Lester was amazing! I made several changes in the months before our trip and Lester always responded with answers and suggestions. My travel companion had to leave mid-trip and Lester was somehow able to secure refunds from the tours and hotel. I can’t say enough about his professionalism, knowledge, and service. Thank you, Lester! I would use Anywhere and suggest it to others in a heartbeat. Great job! Thank you. Will use Anywhere again! Our tour guide was very knowledgeable and helpful throughout. He went out of his way to show us various things such as animals and plants, even on the ride back home. We stopped at a popular park because he thought it was worth seeing. Great guide! Loved all three hotels, loved the stress free pickups and transfers, loved almost all the excursions, chris’s Favorite was the fishing, mine was the hanging gardens and snorkeling, we both loved the zip line. Thanks again Lester!!!! Thank you Lester!! We had an amazing time. Your recommendations were spot on. Lester was great! I will be in touch in a few years I'm sure! Thank you! Thank you! It was a dream vacation!!! We will be going again! I made several changes and never had a problem. The trip was perfect and I loved knowing that everything was taken care of. Lester, we had a fabulous trip and appreciated your recommendations! Thank you for your expertise! I know we caught you at a busy time, but I would have appreciated better response times on hearing back from you, especially after you mentioned how important it was for us to make timely decisions on our end. We got back to you quickly, than I sort of felt the ball was dropped on the Anywhere’s side. I have my own business and find there is always room for better communication. Costa Rica is a lovely country and we are so grateful that we had the opportunity to visit there! We were rejuvenated and thoroughly enjoyed our adventures, the ecology, the people, the wildlife, the food and the gorgeous sunsets! Sweet place! We would definitely come back if we could afford it! As it was our 30th wedding anniversary, so we splurged, but I think it is back to camping for us for now! Pura Vida! And Larga Vida! We had a great four week trip in Costa Rica and Anywhere made it all come together in way that you would hope for.